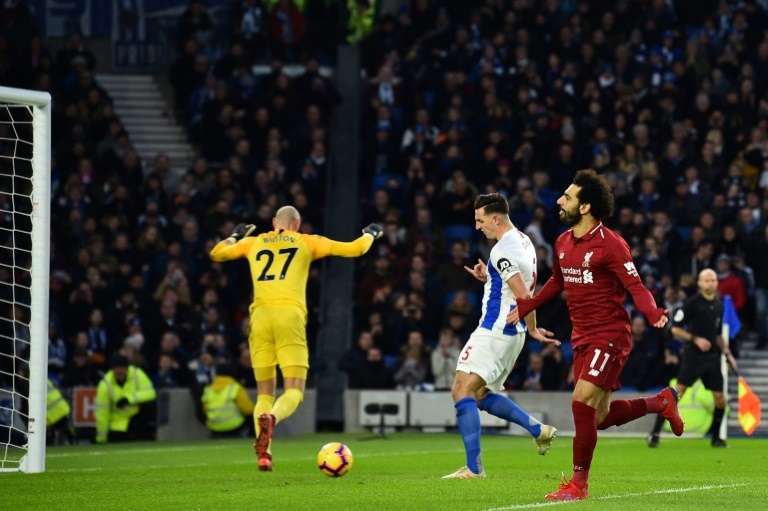 Liverpool manager Jurgen Klopp hailed his side’s maturity as Premier League contenders after breaking down an obdurate Brighton thanks to Mohamed Salah’s 50th-minute penalty in a 1-0 win on Saturday. Klopp’s men had lost their last two games in very contrasting fashion as Manchester City inflicted Liverpool’s only Premier League defeat of the campaign nine days ago before a much-changed side lost in the FA Cup to Wolves. Liverpool were far from their fluent best on England’s south coast, but ground out a vital win to move seven points clear of City at the top of the table thanks to a 13th clean sheet in 22 league games this season. “The headline before the game was ‘be ready’, the headline after the game is ‘very mature’,” said Klopp. “It’s so important. On the good days everybody can win; on average days not a lot of teams can win football games and, on a bad day, only a few can win. Salah was just one a number of first-team regulars to return from Monday’s defeat by Wolves, but the Egyptian and the rest of Liverpool’s forward line were starved of service before the break as Brighton sat deep and the visitors dominated possession without any cutting edge. Salah immediately signaled a change in Liverpool’s intent after half-time as his powerful shot at the end of a purposeful run was well saved by David Button. Brighton, though, were architects of their own downfall moments later. Salah was given too much room inside the area to turn and Pascal Gross then hauled down last season’s Premier League player of the year. “I feel for Pascal because Mo Salah is probably the most dangerous player once he gets in those positions one on one,” said Brighton boss Chris Hughton, who had no complaints over the penalty award. Salah stepped up to blast the penalty past Button and move level with Pierre-Emerick Aubameyang and Harry Kane as the league’s top-scorer on 14 goals for the season. One moment of madness from Gross undid Hughton’s gameplan to defend and frustrate the league leaders. Yet, the German midfielder had a chance to make amends almost immediately with Brighton’s best opportunity to level, but his shot was bravely blocked by Fabinho. From then on Liverpool looked more likely to add to their lead than concede as Firmino’s fierce strike from outside the box was placed too close to Button before Georginio Wijnaldum and Sadio Mane fired wide. Salah passed up a glorious chance two minutes from time when he turned James Milner’s driven cross wide from point-blank range. That could have proved costly when Florin Andone escaped in behind the Liverpool defence in stoppage time, but his low cross found no takers. And Liverpool held out to ensure a largely forgettable 90 minutes could be remembered as another important step on course to the title come May.